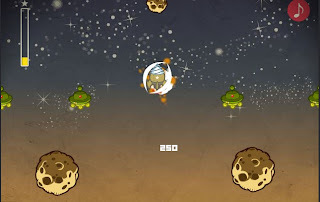 Meteor Wars is another arcade action game on newgrounds developed by dijiko. Set in a war between humanity and alien invaders, you have to deflect gigantic rocks from outer space before they hit the ground using a funny looking mighty ship. The game features 20 challenging levels and easy yet addicting gameplay complemented with nice cartoon graphics and good background music. MW is controlled entirely by mouse - the spaceship follows the movement of your pointer. Tip: destroy the meteors quickly to fill your power bar and enable the shield which can destroy flying saucers. Also, watch out for extra life and other power ups which you can use to your advantage in winning certain levels. Whilst we wait for a full Meteor Wars walkthrough, here is a gameplay video.